For teachers and students! The Action Against Plastic workshop will involve hands-on activities and share resources to help teachers and students take action to mediate the problems of plastic in our society. 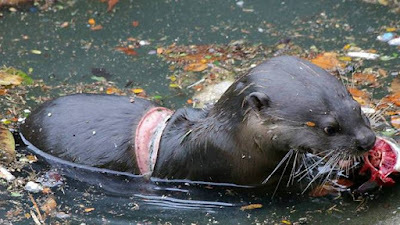 Aquarius the Otter, injured by a plastic band. Photo by Abel Yeo. Full story here. This workshop is in support of International Year of the Reef 2018 and Singapore's Year of Climate Action, and organised by Jane Goodall Institute (Singapore) and supported by Singapore Chinese Girls’ School. In 2016, we generated 822,200 tonnes of plastic in Singapore, about the total weight of all the private cars here. 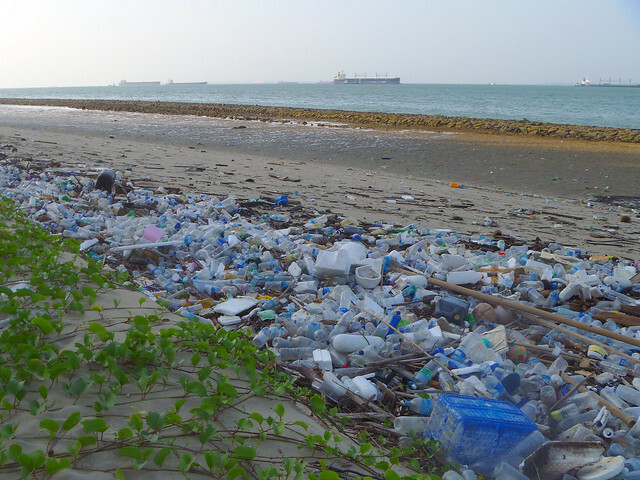 In Singapore,"only 51,800 tonnes of plastic were recycled last year, down from the 57,554 tonnes in 2016." (ST report published on Mar 20, 2018). Globally, the production and consumption of plastics have continued to rise. Plastic litter accumulation at Tanah Merah. Plastic is durable and very slow to degrade. They pollute the seas and stay in our natural environment. 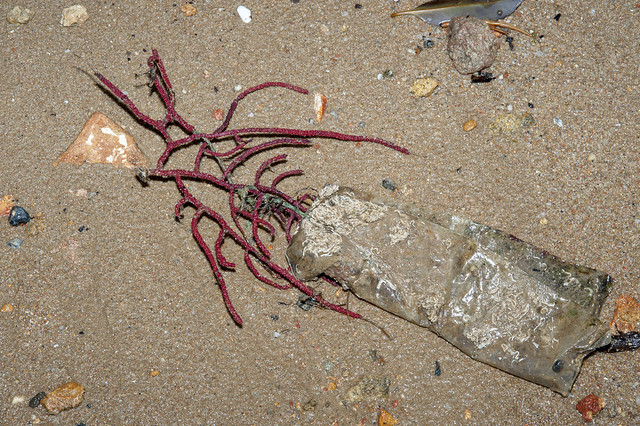 Uprooted sea fan entangled in plastic litter. Recent studies have also shown that plastic have gotten into the guts of seabirds and marine animals. 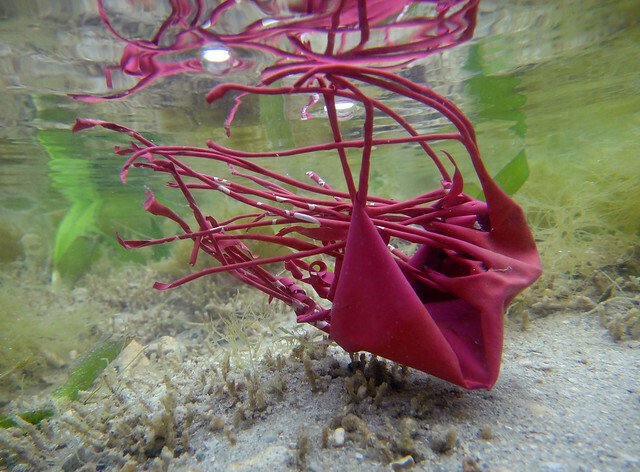 a jellyfish, favourite food of our sea turtles. What can we do as educators to raise awareness amongst our students and inspire them to take action? 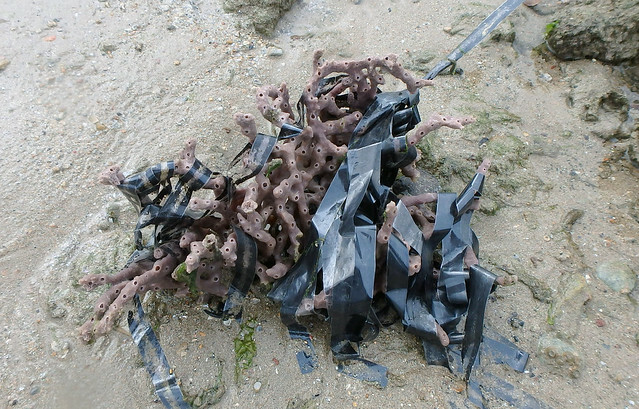 Uprooted sponge entangled in plastic litter. 2018 is the International Year of the Reef and Singapore's Year of Climate Action. Environment and Water Resources Minister Masagos Zulkifli has stated “it is important to raise the level of national consciousness around the need to take individual and collective action to fight climate change". In support of these initiatives, Jane Goodall Institute (Singapore) is organising the Action Against Plastic workshop for both teachers and students. Resources and hands-on activities will be shared during the workshop to help teachers and students take action to mediate the problems of plastic in our society. Please register at https://goo.gl/forms/57w8B6Iw3HHkPktl1 with your students for our workshop by 30 Mar 2018. Contacts: Ms Quek Xiao Tong (quekxiaotong@gmail.com) or Ms Tan Beng Chiak (bengchiak@gmail.com) for more details.